Universal Music Group is suing MySpace - claiming the online social network site is encouraging its users to illegally share music and music videos. It accuses MySpace of allowing people to illegally upload videos and of providing the technology for users to share the content with others. Links to work by its artists including The Killers, Jay-Z and Gwen Stefani are available, Universal alleges. But MySpace said it acted legally and dismissed the "meritless litigation". It added that its procedures for removing illegal downloads were good, and that it fully complied with copyright laws. "We have been keeping Universal closely appraised of our industry-leading efforts to protect creators' rights," MySpace said. "We provide users with tools to share their own work - we do not induce, encourage, or condone copyright violation in any way." But Universal's lawsuit, lodged in a US district court, claims that MySpace "encourages, facilitates and participates in the unauthorised reproduction, adaptation, distribution and public performance". In a statement it added: "Our music and videos play a key role in building the communities that have created hundreds of millions of dollars of value for the owners of MySpace. "Our goal is not to inhibit the creation of these communities, but to ensure that our rights and those of our artists are recognised." Universal alleges that MySpace tries to avoid liability for copyright breaches by making its users give the website the right to publish the content. However the users do not have the right to give that permission, the music firm argues. MySpace last month unveiled technology to block users from uploading music to their pages for which they do not hold the copyright. It will use a file-filtering application to scan old and new content to weed out any unauthorised material. Illegal files, the company said, would be removed and persistent offenders would be banned from the site. 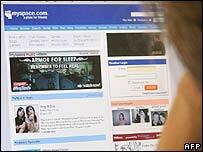 The issue of copyright on sites such as MySpace is a hot topic. Google is trying to win permission from media companies to broadcast output legally on YouTube and avoid the threat of legal action.